We parked at the Silver Bay SHT trailhead at 8:20 am. The shuttle was scheduled to pick us up at 9:07 am and take us to the trailhead at Crosby-Manitou State Park, approximately 37 trail miles north. The shuttle showed up around 9:15, and we met a couple from Kentucky who were being driven to the far north end of the trail and planned to hike it in its entirety (referred to as thru-hiking). They had stopped in the trail HQ in Two Harbors the day before and received an updated weather forecast. Temperatures were going to be colder than expected, and they were told there was even the possibility of snow flurries. This didn't bother Craig and I too much, but the woman we were speaking with was nervous; she had planned for the 50-70 degrees an earlier forecast had predicted, and in doing so, brought her +45 sleeping bag instead of one rated for colder weather. They were experienced long-distance hikers who have likely handled many challenging situations, but I would think of her now and then over the coming week as the weather did a spectacular swan-dive. I didn't think to ask what kind of shelter they were using, but if they were tarping, I'm not sure how she fared. I hoped that she brought some good warm layers, and wasn't too miserable during the cold, windy nights. At 10:00, the shuttle dropped us off on a dirt road next to an unassuming trail sign that marks the southbound trailhead at Crosby-Manitou State Park. It was much warmer than we expected this morning, and mosquitoes were bothersome throughout the day. The trail was interesting, however, and within an hour, we found ourselves in a section thick with cedars, which provided shade and cooled things off a bit. Soon we reached the east branch of the Baptism River and a spot where the SHT intersects with the North Shore State Trail, which crosses the river on a bridge. 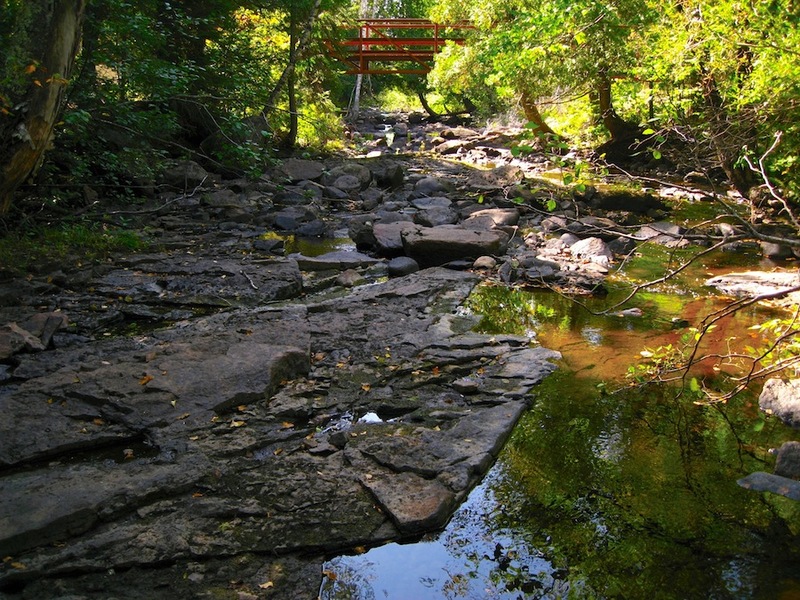 The North Shore State Trail is a snowmobile trail that can also be used in the summer for horseback riding, mountain biking, or hiking. Beyond the bridge, the SHT re-enters the woods and we found ourselves at Blesner Creek Campsite. 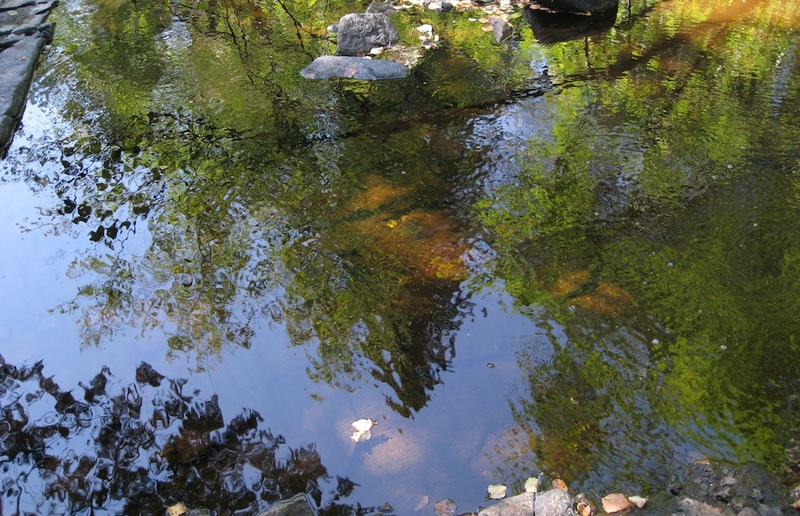 Blesner Creek flows into the Baptism River, and the campsite is situated between the two streams, just before they connect. It is a wonderful spot for a campsite, and although we had hiked only about three miles, we seriously considered staying there. While we thought over the idea of setting up camp and adding extra miles to the following day, I filtered water from the river and Craig made burritos for lunch. We ended up spending an hour there taking a break, eating lunch, and enjoying the surroundings before deciding to keep going. Even though we had not planned to stay at Blesner Creek, we hoped that we weren't making a mistake leaving such a nice spot to stick with our itinerary. Just after 2pm, we arrived at Sonju Lake, which has two areas for camping – a north site and a south site. We planned to stay at North Sonju Lake Campsite, because it was supposed to be right on the lake shore. This didn't appear to be the case once we got there. The lake was visible through the trees, but the campsite was in the woods. The guidebook says there are 4 tent pads there, but we couldn't see any spot that stood out as a clear place to pitch a tent and explored the area a bit to see if we were missing something. Over the coming week, we would learn that the book's “tent pads” are not always obvious, and are probably more of a guideline of how many small tents could potentially be set up at a campsite. We decided to check out South Sonju Lake Campsite, which was not on the shore and had 6 tent pads according to the book. Here a clearing in the woods provides a fire ring and enough space for several tents. Although we were the only people there and there was a lot of space, it took us quite a while to decide on a spot for our tent because the ground was very uneven and sloped in each place that looked promising. We finally found a patch of flat ground and began to set up, only to find that the ground had so many roots and rocks just under the surface, that staking our rainfly was nearly impossible. The questionable skies above the lake did not make us feel comfortable leaving the rainfly off, so we spent even more time moving our tent this way and that until we could coax all of the stakes into the ground. This would end up being a regular struggle throughout the week, and we just had to get used to the challenge. Once camp was finally set up, we took some time to collect water and explore the lake. A narrow boardwalk provides access to Lilly's Island, a small rocky island near the lake's east end. This was a fun place to visit, and we spent some time there sitting on a boulder, cooling off, and watching wind ripple across the surface of the water. Despite the cold weather that would come, the week started out very warm, and it had been a hot, sweaty day on the trail. The wind had become fairly strong, and stormy-looking clouds gathered periodically overhead, drifting away and returning throughout the rest of the day. Lilly's island would remain one of my favorite spots of the whole trip, and I was glad that we had decided to come here instead of staying at Blesner Creek. Back at camp, we noticed ash on the surface of our tent. This seemed weird, but we assumed it was being kicked up from the nearby fire ring due to the periodic gusts of wind, though the fire ring seemed undisturbed. 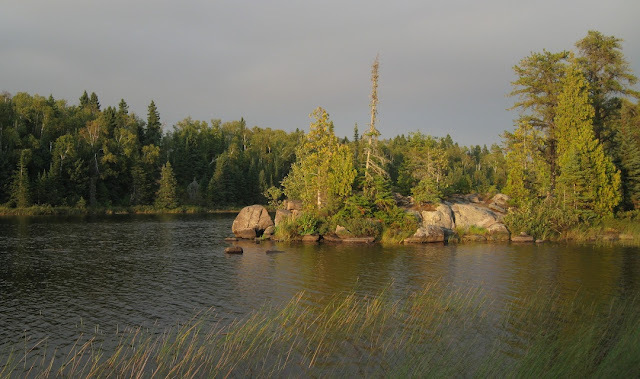 Little did we know what was going on north of us near Boundary Waters (we would not learn the news until 3 days later). We made Packit Gourmet's tortilla soup for dinner and went to bed when it started getting dark. Small animals (probably mice) scurried around outside of the tent for a while, and I tried to read but ended up drifting off to sleep quickly. I tend to dream a lot when camping, and that night I dreamed a bear was lurking around the outside of the tent, sniffing at the ground. It rubbed against the tent above my head when it walked by, and I could feel it's fur sliding against the top of my head through the thin nylon wall. I woke up and there was nothing but silence. Gorgeous scenery and photography. Looking forward to the rest of the story... B.